SUNRISE can normally count on a few devoted fans standing behind the set in Sydney's Martin Place, energetically waving on camera, but things were a little different this morning. The show's glass backdrop was inundated with people holding red balloons and signs covered in the word "Orkambi". The group of more than 100 were advocating for the lifesaving cystic fibrosis drug Orkambi to be put on the government's Pharmaceutical Benefits Scheme (PBS). Cystic fibrosis is a debilitating genetic condition that causes fatal lung damage. Less than half of those with cystic fibrosis live to 40. Orkambi currently costs a whopping $250,000 a year and is the only drug available in Australia to treat the cause of the most common strain of cystic fibrosis. It has been shown to improve lung function and respiratory symptoms. Close to 100 people have come in from around the country today to join us as we make our voices heard and fight for #Orkambi. The time is now! The Pharmaceutical Benefits Advisory Committee (PBAC) has voted against putting Orkambi on the scheme three separate times but always maintained it was the pharmaceutical company that's making things difficult. In August 2017, a spokeswoman for the federal Department of Health told the ABC they'd offered Vertex Pharmaceuticals $100 million in compensation but the company refused. "Recognising that there was a high unmet need for new therapies for people with cystic fibrosis, the PBAC proposed alternative pricing approaches to Vertex, but the company did not respond to this offer," she told the publication. Vertex has previously said the government's $100 million compensation offer is a 90 per cent discount on the drug and that their offer is placing them in an "impossible position". 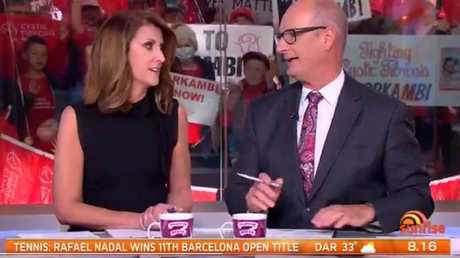 Sunrise hosts Natalie Barr and David Koch addressed the crowd of more than 100 standing behind them on the show. "We've got a lot of friends here at Brekky Central this morning," Barr said. The Barrett family, whose three-year-old son Connor has cystic fibrosis, came all the way from Bunbury, Western Australia to appear on the show. Connor's mum Taryn has been an outspoken advocate for Orkambi after finding out the drug could give her little boy an extra 23 years of life. Connor is already taking 20 different medications a day for his cystic fibrosis but Taryn said the price of Orkambi was "crushing" for her and her family. "When he was first diagnosed we were told about this medicine, and that it's a big game-changer, so to know that there's a medicine that treats the underlying cause of the disease which has been developed, that's really exciting for us," Taryn told the ABC. "But then to be told that no, Australians won't be able to be given access to it, because it's too expensive, that's just crushing," she said. Sunrise host David Koch implored Vertex to "come to the party". and that drug company, according to the government, has to bring that price down. They're charging a lot," Koch said on air this morning. "This is a life-changing drug that helps a lot of people but the pharmaceutical companies have got to come to the party as well. "They just can't bump up the prices and expect everyone to pay for it too," he said. The Sunrise backdrop was full of cystic fibrosis advocates. Cystic fibrosis sufferers in the UK are in a similar position where Orkambi costs £100,000 ($A182,000) a year per patient. Vertex rejected an offer from the nation's National Health Service after claiming the offer wasn't enough to fund research. Last year, cystic fibrosis sufferers advocated to get another life-changing drug Kalydeco on the PBS. The drug, also developed by Vertex Pharmaceuticals, was made available to a wider range of people from May 1, 2017. Before the drug was put on the PBS, sufferers had to fork out $300,000 a year. Now, coming under the PBS, it costs just under $40 at the pharmacy.